Send the family on holiday, clear your diary, farm out the pets, buy in plenty of tins and put the phone on divert: you will spend the next two weeks on your own, in the dark, happily hunting and listening to a treasure trove of long-forgotten goodies from the wonderful to the weird. More than 5,000 historical recordings (each one, a side of a 10- or 12-inch coarse-groove disc), dating from about 1915 to 1952, have just been made available online for anyone to stream or download, free, anywhere in the world. 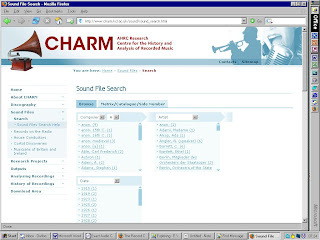 The CHARM online sound archive combines transfers made under the auspices of two academic projects: CHARM itself, the AHRC Research Centre for the History and Analysis of Recorded Music, which ran from 2004 to 2009; and 'Musicians of Britain and Ireland, 1900-1950', brainchild of Professor Daniel Leech-Wilkinson of the Music Department, King's College, London, one of the Associate Directors of CHARM. Daniel brilliantly secured funding from the UK's JISC and so more than doubled the number of transfers funded under CHARM. The transfer engineers were Andrew Hallifax, who has worked with many classical artists and companies as well as making recodings for his own record label, Big Ears; and Martin Haskell, who has worked for Decca, ASV and other companies and engineered many, many reissues of historical recordings. The project would not have been possible without the amazing discographical research done over many decades by the likes of Frank Andrews, Michael Smith, Ernie & Ernest Bayly and Bill Dean-Myatt, all published by the CLPGS, and by Alan Kelly of Sheffield. I must declare an interest: I ended up being the main selector of recordings to be transferred by the two projects, though others, inside CHARM and out, were also free to make suggestions; and our warmest thanks must go to the doyen of British critics of singing, John Steane, for kindly and freely giving of his fabled expertise in that domain. Thank you so much for making us aware of this extremely useful website! Thank you both. The site only went live two days ago so I suppose King's College will be monitoring the traffic and considering their capacity. I hope it's not too annoying! 0.4 KBS. The good old days of 1995 internet :) But it's a great sign that the initiative is picked up everywhere and a success! I have been using this site for information on 78's for many months. I am delighted that so many 78 sides can now be listened to. The transfers that I have selected thus far confirm what I have always known. Most 78's recorded by the major companies have always been perfectly balanced. I too applaud the initiative, but I agree with earlier comments about the download speed. The first four sides that I downloaded were done in minutes, but ever since, I am getting messages that any one side (4 to 5 minutes of music) will take at least four hours, or more often 8 to 10 hours to download. I am using Mozilla Firefox, so I must wonder if it's a problem with that particular software. Does CHARM recommend a download software? Wow, is all I can say! Thanks to you and everyone involved in this project! I do hope the download speed issue will be somehow fixed...it does take most of a day to grab a few files, and concurrent downloads seem to result in only one file actually downloading. I see an email address at CHARM to ask such a question, but what do you think of the chances of permission being obtained to post versions with side joins (and no further processing) on a blog such as mine, with proper credit given? Btw, the other day I downloaded some files on my campus (super high speed) computer, and the speed was about 50 times faster than when I had tried previously. Just now at home I downloaded a 40MB zipped version of about 6 files in just over a minute. Seems to me that the speed problem has been addressed! Just wanted to say that this dBase is working quite "smashingly well!" Thanks so much for this treasure trove. Got to admit that my challenge is piecing the aides together. I just don't have the talent, or patience, of Neal or Rolf or yourself. But your efforts are worth my continuing to muddle through and learn more about transfers! I am delighted that the speed question was resolved. I've downloaded two Symphonies, each taking less than 10 minutes! There was an interesting mention in the new "Gramophone" magazine as well.